Need pesto fast, but you're out of pine nuts? Never fear! This three-ingredient Presto Pesto recipe is here to save the day for pasta, salads & more. Process ingredients in food processor until well blended. Toss with hot cooked pasta for an easy meatless entree. Pour prepared pesto into ice cube trays and freeze until firm. Then, pop the frozen pesto out of the trays, place in freezer-weight resealable plastic bags and store in the freezer until ready to use. Thaw in refrigerator before using. 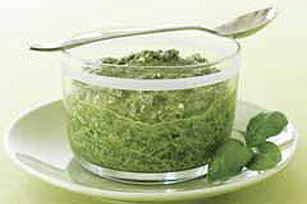 Store pesto in tightly covered container in refrigerator for up to 1 week.